ZeroBlind Area：Our smart mirror has NO blind spot rear view angle which helps you see all of your surroundings behind you. It will not block your sight even on rainy days especially when you’re reversing, which other mirrors cannot achieve. NO worries about the obstacles on the back seat anymore. Our mirror dash cam enables you to drive safely! Dual Cam Simultaneously Recording: This Smart Mirror has two cameras that allow for simultaneously recording videos from two different angles. When you’re ready to reverse simply press the rear camera button or set it to switch automatically when reversing. Our smart mirror will then switch to the back-up camera view with the parking assist lines. Full 3-lane Coverage with 170° Wide-angle Lens：In order to reduce blind spots, this smart mirror camera uses a 170° ultra wide angle all-glass lens, which monitors 3 lanes comfortably. 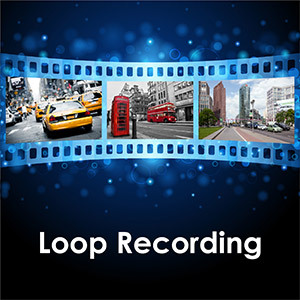 The camera is highly sensitive, enabling accurate and detailed capture recordings. Easy To Install: There’s no need to remove the original rear mirror, just pop it on over the existing rear mirror. The initial rear mirror won’t get damaged due to the design and padded back of the smart mirror. The built-in gravity sensor, when the collision occurs, the car recorder will activate, it will recorded the video and locked. Locked images and videos are saved in the sd card, and thoes files will not be overwritten. LCD dual dash camera: The HD mirror cam works great day or night. 1080p HD view, can capture the licence plate at day time. 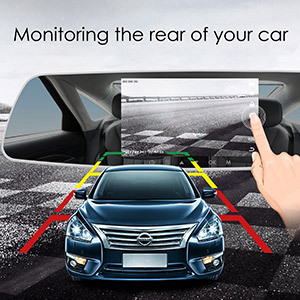 With the Smart mirror camera, your car will have all the necessary functions, car-reverse system, voice function and automatic shockproof function, which will absolutely save you space and money. Get Yours Now and Take Advantage Of Our Huge Sale! It’s Almost Over So Don’t Miss Out. All of our products are made with high-quality materials and careful attention to detail. customer satisfaction is our #1 Priority!